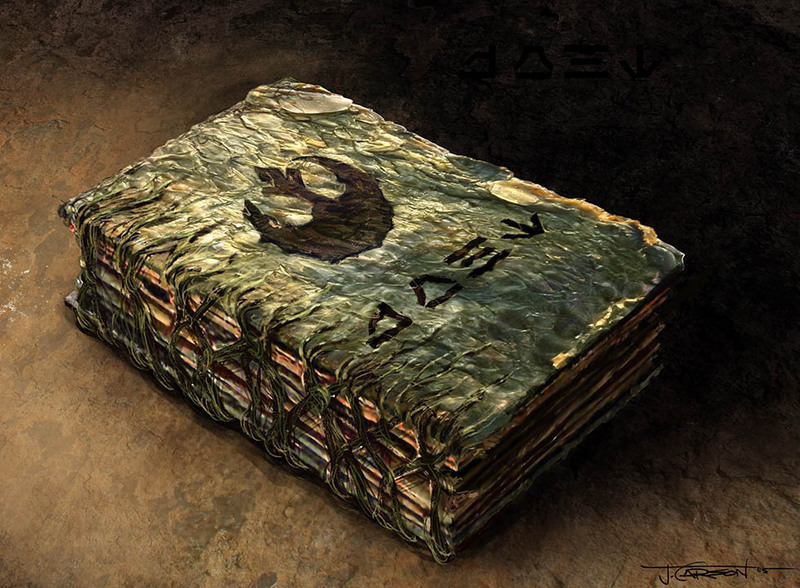 There’s a feeling of reverence surrounding the ancient Jedi texts. 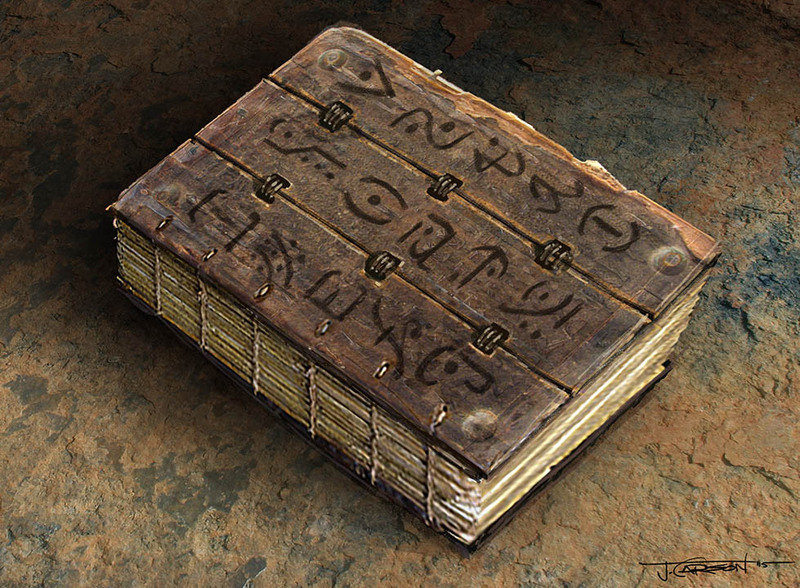 Secreted away on Ahch-To in a sacred place built a thousand generations ago to keep the knowledge of the Jedi Order safe for future disciples, the venerable tomes represent the last remnants of the Jedi religion, the last echoes of wisdom from an order on the verge of extinction. In-world, the library is a symbol of Luke Skywalker’s lost faith — in himself, the Force, and the teachings of his masters, — realized as simple, incendiary paper volumes that he tries but fails to torch in Star Wars: The Last Jedi. 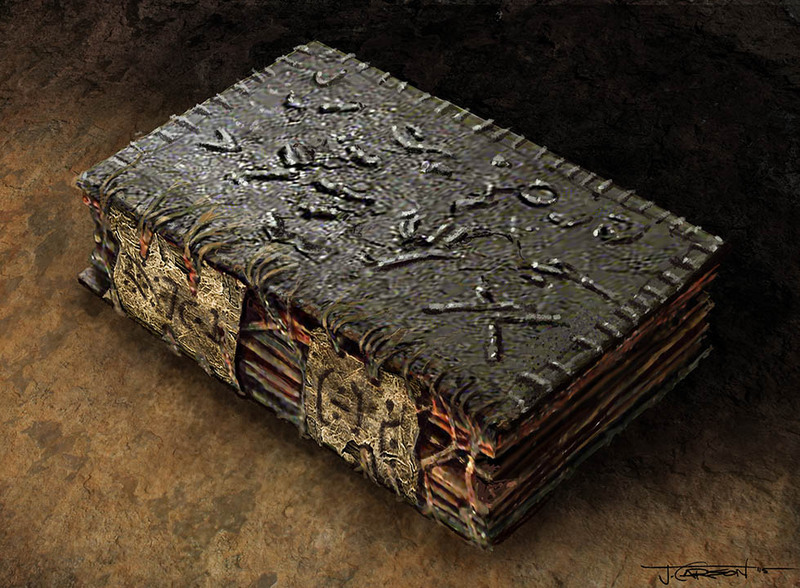 Printed books are a rare find in a modern galaxy that prefers datapads and holograms as primary forms of communication. 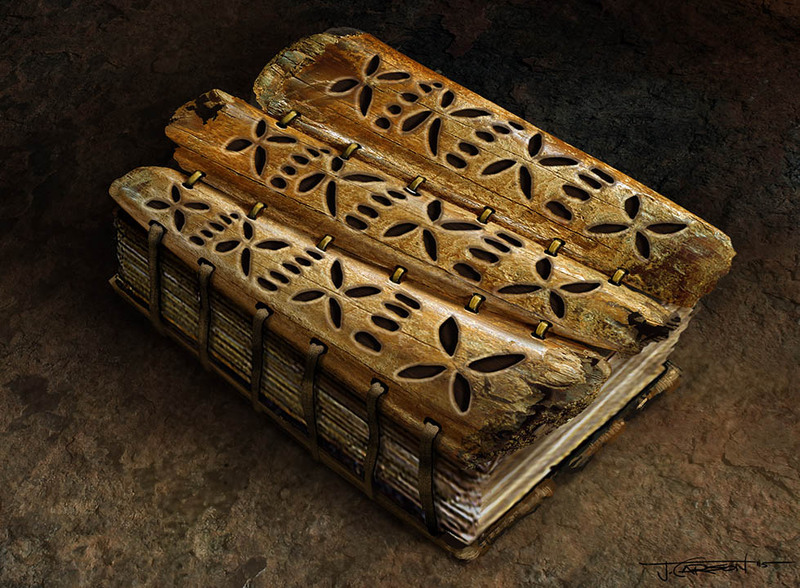 But stashed away in a drawer aboard the Millennium Falcon, the scriptures survive for another day in Rey’s care. Portia Fontes, Lucasfilm’s physical assets coordinator, shows off the hero prop. 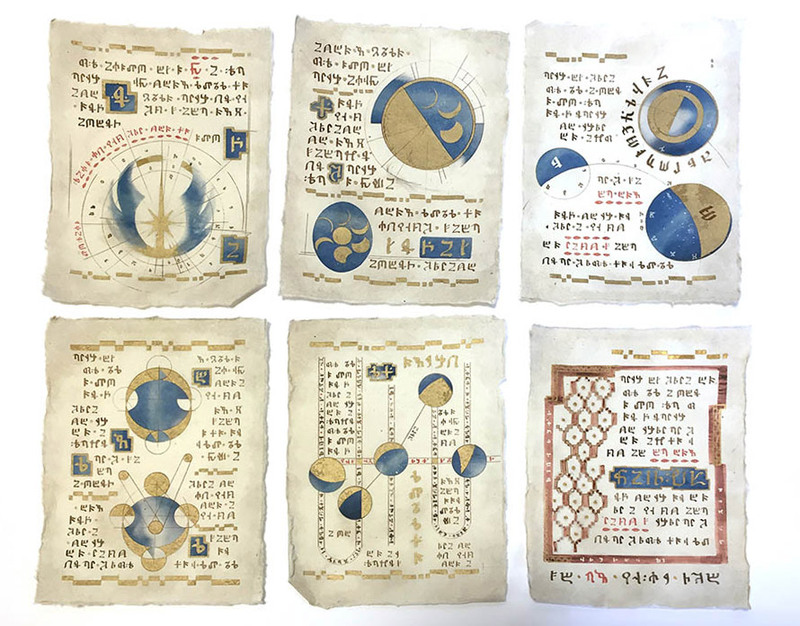 To create the hero Jedi Order book, pulled from the petite row and opened to reveal the Jedi emblem for mere seconds on screen, prop makers and artisans designed and printed painstakingly detailed vellum-like sheets then bound them in the cast of a hand-carved cover. The final effect is mesmerizing in person. 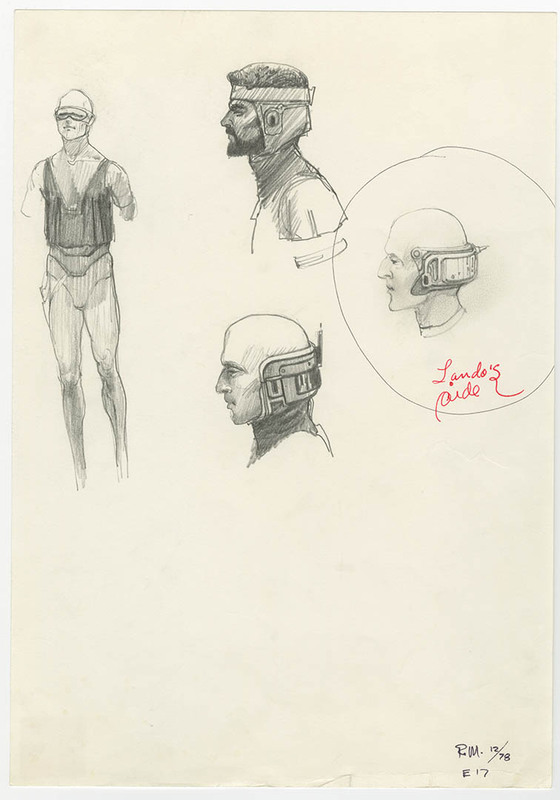 “This is a pretty prized piece,” says Lucasfilm Archivist Madlyn Burkert. Beyond that first page are a host of individual pages, designed and lettered as if they truly held the knowledge of those first Jedi practitioners. There’s incredible attention to detail on each page, layers of gold leaf mixed with blue pigments and an unidentified script, perhaps inspired but some of the earliest scrolls and scribbles from our own human history. 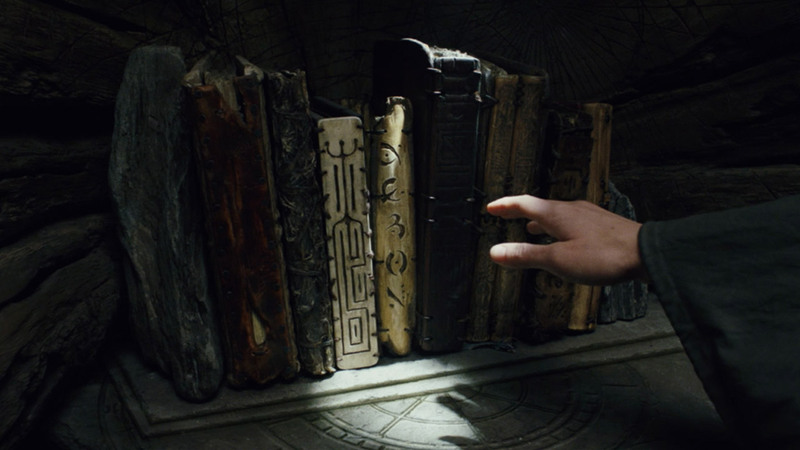 Originally, the props team conceptualized about 40 different volumes, of varying sizes and finishes, which director Rian Johnson narrowed down to a slim 10 finalists for the sacred shelf. Burkert says the prop makers were given free rein with their own personal inspiration, provided that the final series looked like a set of ancient volumes when they were finished. 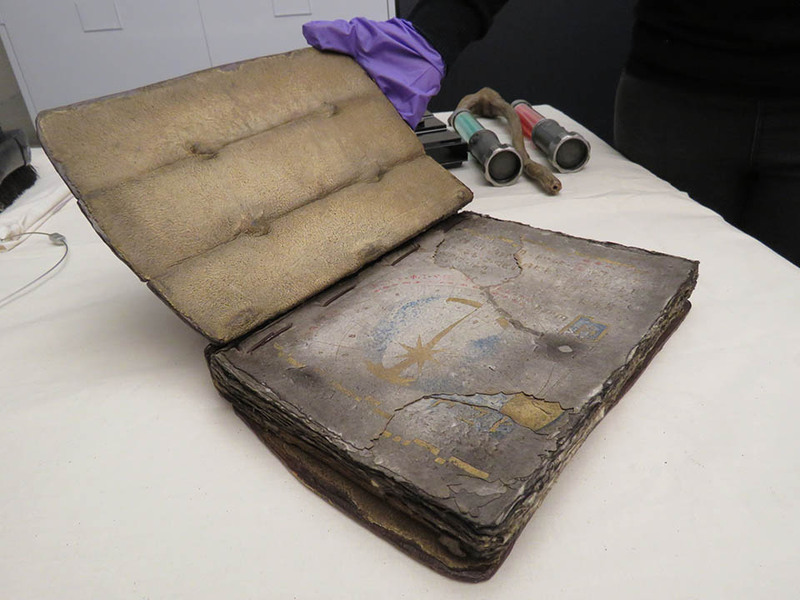 As part of the process, the team researched old book-binding methods, so that each book would be unique in its fabrication. For the hero book, the only volume that gets pulled from the stacks and cracked open on-screen, Burkert says the prop makers created the cover by hand, with lettering cut from leather and applied to the front before being covered in layers of vellum-type paper for texture. Then the entire thing was cast and molded from resin before being tied back together. “For the cover, there’s leather strapping that holds it together,” Burkert says. 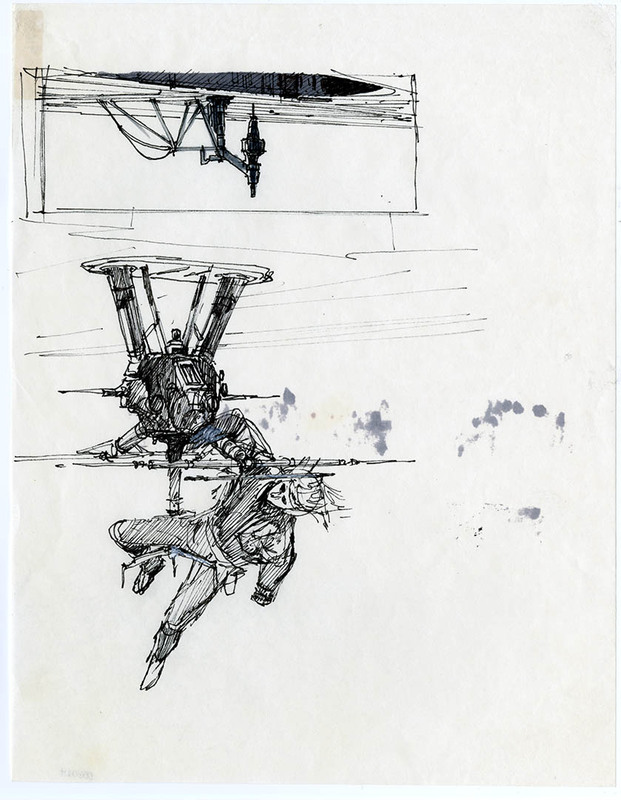 Meanwhile, Lucasfilm’s graphics department created about 80 unique interior pages on handmade paper, taking great care beyond the single page glimpsed in the film. Look closely and you can see the way the ream of paper has some give beneath Luke’s gloved hand. To complete the work, the props department aged and weathered the pages, rebound the book, and added the gold leaf accents. According to Propmaker Martyn Doust, it took the props team two weeks to complete a single volume from start to finish. The finished prop volume has a substantial weight to it, although the bindings make it difficult to flip through like a contemporary printed text. 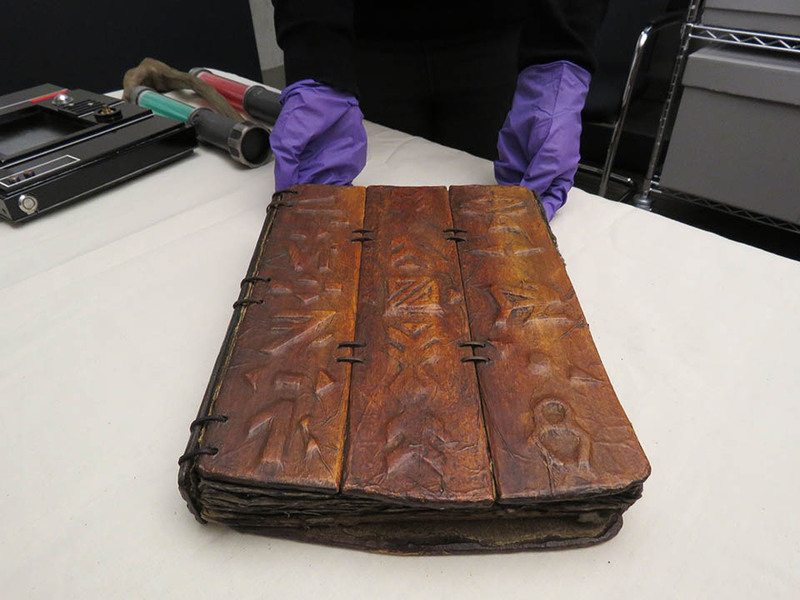 It’s now kept sequestered in a special slip cover and carefully boxed away in the Lucasfilm Archives, a testament to the precision of the prop makers who imbued such an important piece of Jedi history with its own awe-inspiring mystique. Prop photos taken at Lucasfilm headquarters by Kyle Kao. 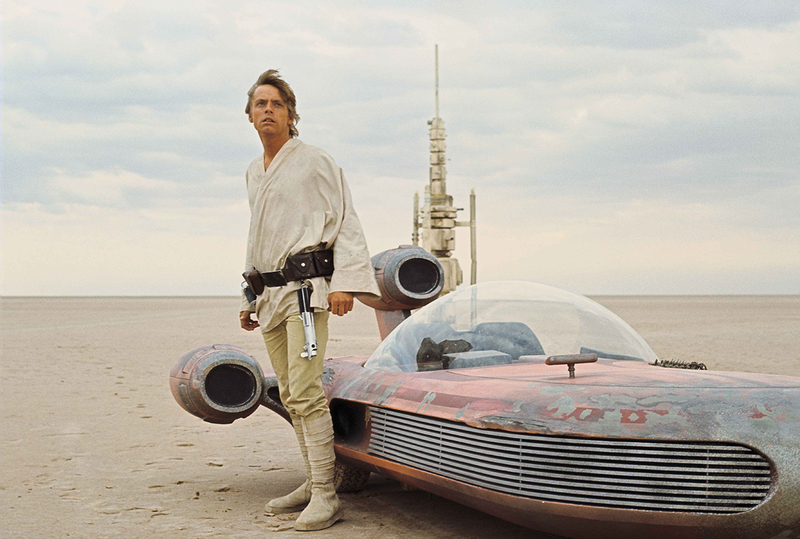 In the original Star Wars trilogy, no character embodies dreams like Luke Skywalker. Looking to the future, his mind on what could be…and how much fun he could have on any of the infinite number of adventures waiting for him just over the horizon. If there’s one thing Star Wars inspires us to do, it’s dream. The power of the Force is the power of imagination. Who among us hasn’t waved their hand at an automatic door, or stretched out toward a TV remote that’s out of reach with the thought that maybe, just maybe… it’ll actually work this time. Through the epic characters and extraordinary adventures of Star Wars, fans of any age can enter a place where anything is possible. For children, it’s the chance to take the first steps into a larger world of powerful imagination in a galaxy far, far away. For parents and mentors, it’s an irresistible opportunity to reconnect with our own child-like wonder as we engage with our young ones, helping them to explore their hopes and wishes. 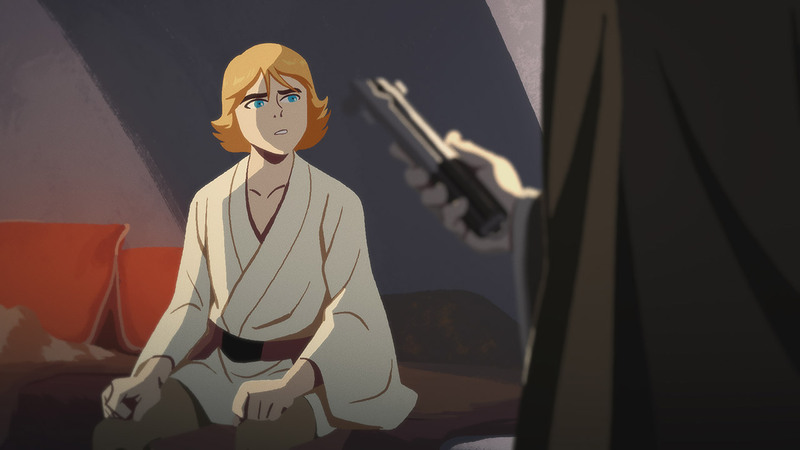 As we begin to explore Star Wars Galaxy of Adventures, the new animated shorts on StarWarsKids.com and the Star Wars Kids YouTube channel, a series of guides will help you pass on what you have learned. Click to open as a downloadable/printable PDF. This Galaxy of Adventures guide helps you talk to the young apprentice in your life about their fantasies. Taking its cue from “Journey Begins,” which you can also watch below, it uses Luke Skywalker’s aspirations as a jumping off point for a talk about their hopes. 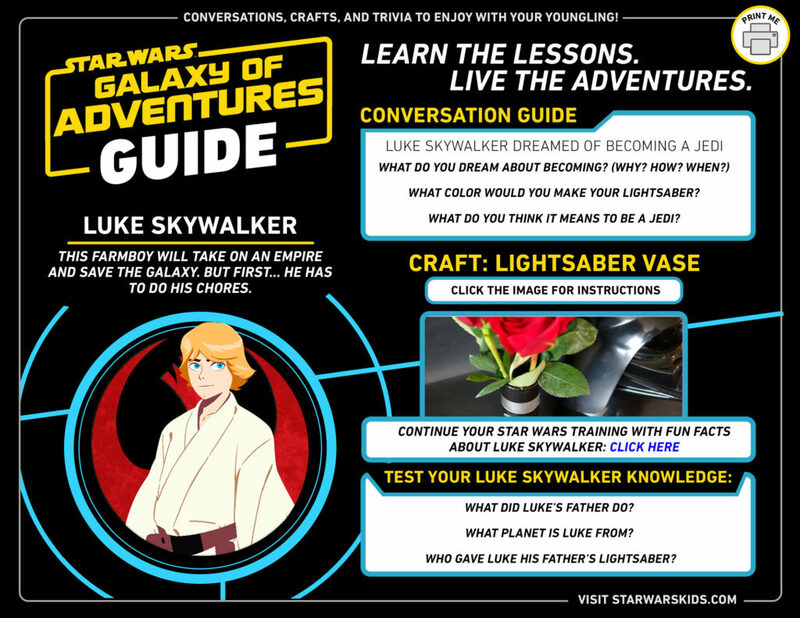 Along the way you’ll also learn how to craft a lightsaber vase, and learn more about Luke’s journey with Galaxy of Adventures Fun Facts. Then, only then, can your Padawan pass their trivia trials: three questions about the origins of Luke Skywalker. For more Galaxy of Adventures, visit Star Wars Kids on YouTube and StarWarsKids.com. Have fun! And may the Force be with you. The look of Star Wars is unlike anything else in popular culture. Step back in time to explore the history and philosophy behind the concepts that define the galaxy far, far away in Designing Star Wars. In a galaxy embroiled in conflict, where wars rage between peaceful ideals and a lust for power, the internal struggle of mechanically-altered men is a microcosm of the battles surrounding them, the clash between darkness and light. Flesh-and-blood intermingles with machine to allow these badly injured warriors to fight another day, yet irrevocably alters the core of their characters. 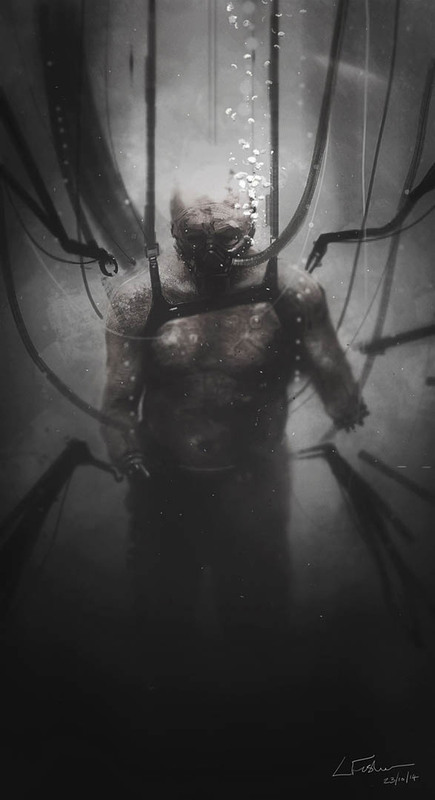 In prolonging basic life-support, the organic creature deep within the metal exoskeleton becomes barely recognizable, assisting autonomic function in a body that is too far gone to exist otherwise. Beginning with the mysterious helmeted figure of Darth Vader, himself more machine than man, and continuing to the more recent resurrection of Maul, no longer a Sith yet building a new life through the aid of myriad metalized parts, cyborgs have struggled to maintain their identity, while reflecting the greater hostilities surrounding them. Each one forces us to consider – when the natural world is fused with unnatural elements, how much of the character’s essence truly remains? For the man who was Anakin Skywalker, mechanical implants are simply a means to extend a life devoted to revenge and fueled by fear. Darth Vader rises, twisted by the Emperor’s machinations, the good in him all-but consumed by darkness, a sinister figure whose presence is punctuated by the shuttering gasps of his breathing apparatus. 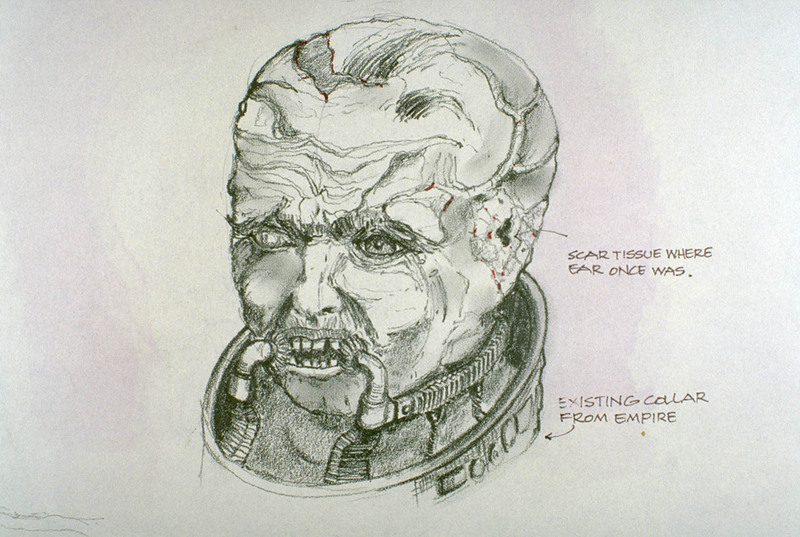 But in peeling back the layers to expose the man beneath the mask, artists and designers who have shepherded Vader through his prequel transformation and to the quieter, vulnerable moments in a bacta bath on Mustafar, have uncovered more of the conflict within. 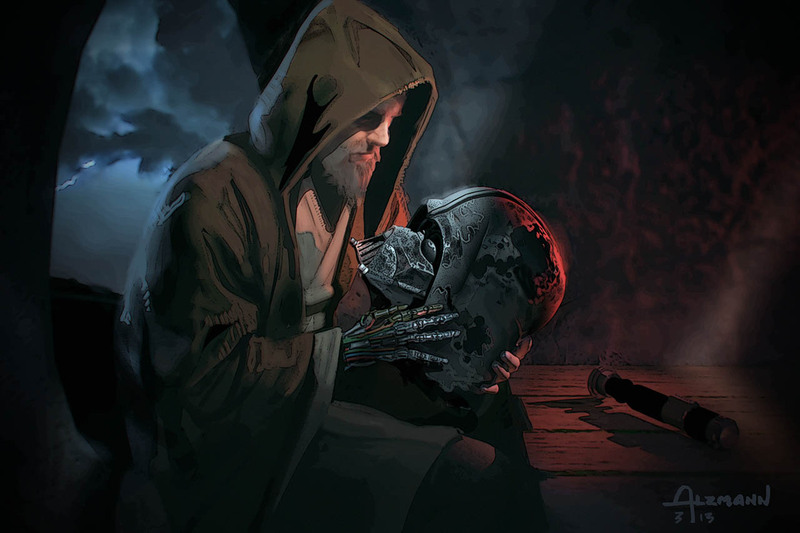 Although his seething rage and fear of loss was already putting Anakin firmly on the path to be the Emperor’s apprentice, losing his right arm to Dooku only to have it replaced by a fine mechanical mechanism marks the beginning of his physical transformation into what he would become. Later, viciously cut down by Obi-Wan Kenobi and burned beyond recognition, his Jedi robes fused to shreds of charred flesh, what remained of his humanity, and the man who was Luke Skywalker’s father, was essentially snuffed out. No longer being torn apart by the competing forces of darkness and light, the last pieces of Anakin’s former self went dormant, the last bit of good in him hidden, his organic systems still functional but the soul of Anakin atrophied and nearly obliterated by the Emperor’s lies. Under Palpatine’s watchful gaze, Darth Vader was built from the ashes of his former life, restored in a fashion, but warped beyond all recognition, stumbling off the operating table a monster of his master’s creation. Only his son, seeing beyond this horrifying façade, could save him and put his tormented soul to rest. 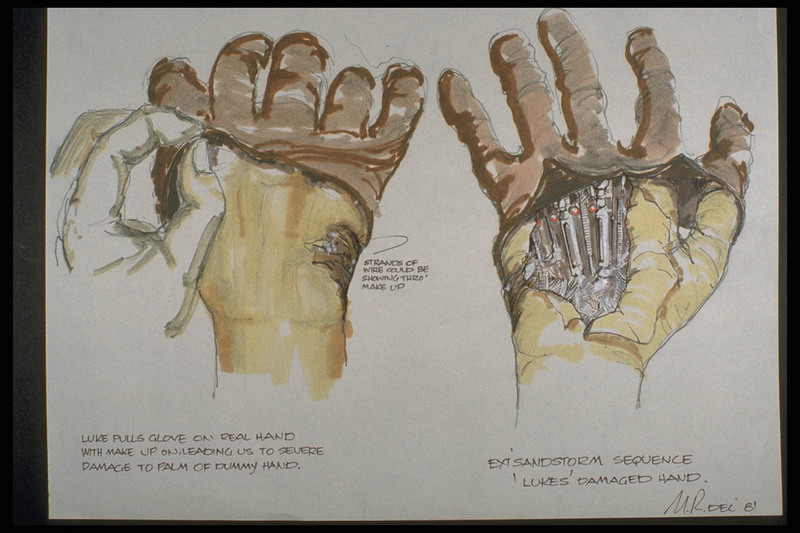 Luke’s own bionic limb arguably deepened his compassion for the vestiges of his father left behind Darth Vader’s mask. His hand severed in combat during their duel on Cloud City, Vader attempted the same kind of manipulation that had worked on Anakin all those years ago. “Come with me,” he says. “It is the only way.” But Luke sees another solution, preferring to let go and free falling into the unknown. Luke’s connection to his sister, Leia, proved to be stronger than any mind trick or devious ploy, and safely aboard the medical frigate, like his father before him, he was fitted with a mechanical limb. Yet, unlike Vader, Luke never lost sight of his humanity or his identity. His new hand served as a reminder of his own mortality, and allowed him to empathize with Darth Vader after his green-bladed lightsaber left his father’s own hand a smoking stump of exposed wiring. Luke delivered the blow (and several more) in defense of his sister, enraged by Vader’s threat to try to turn her, but confronted with his father’s vulnerability, he realized not only that he’d moved beyond defense to blind, spitting rage, but that he and his father were not so different. A hand for a hand had settled the score. If he continued and murdered his father, he would be no better than the monster he once believed Vader to be. 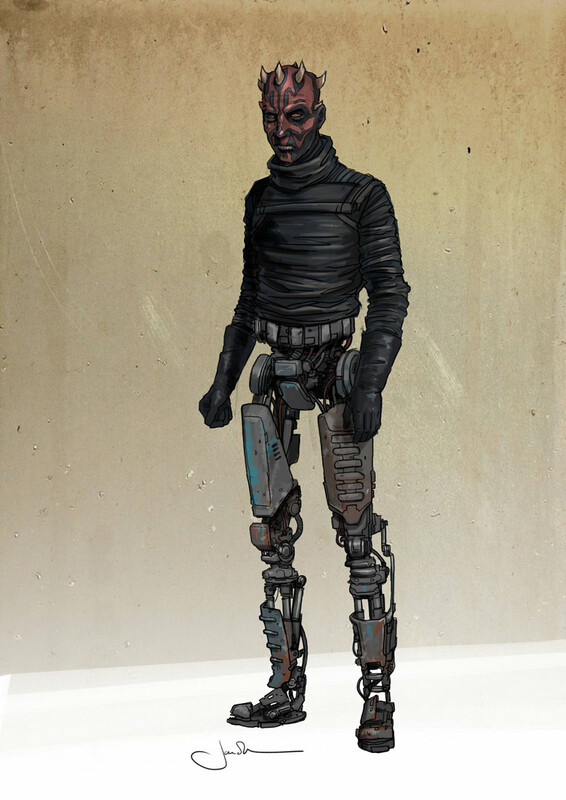 For Maul, a body fused with mechanical pieces salvaged from a garbage heap may have fueled his madness, but was not to blame for his journey down the path to the dark side. 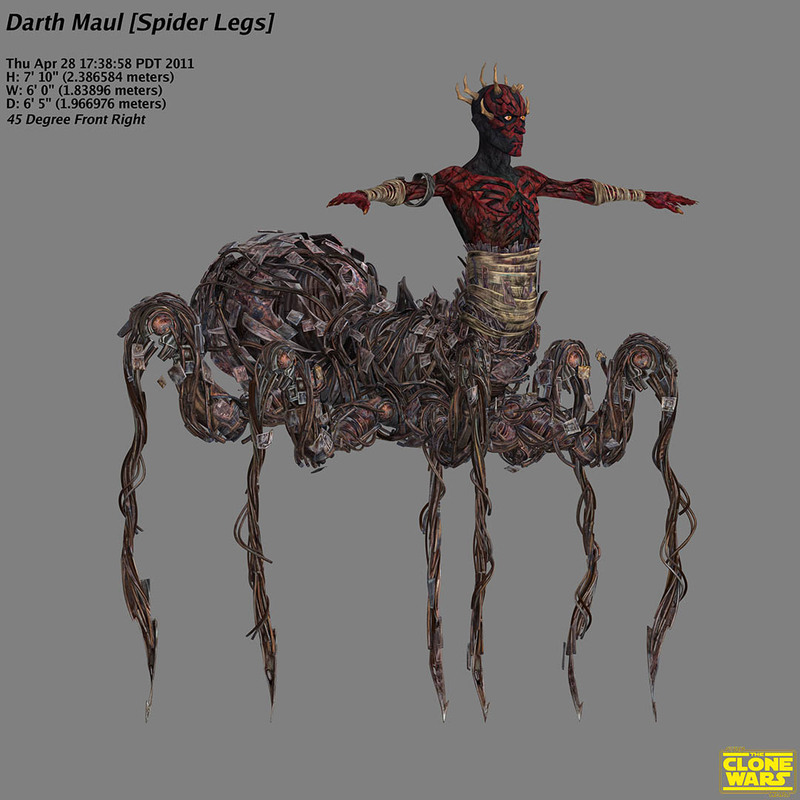 When Obi-Wan cut down Darth Maul, cleaving the agile Sith Lord in two and seemingly destroying the Zabrak warrior, he was left for dead by his master Darth Sidious. 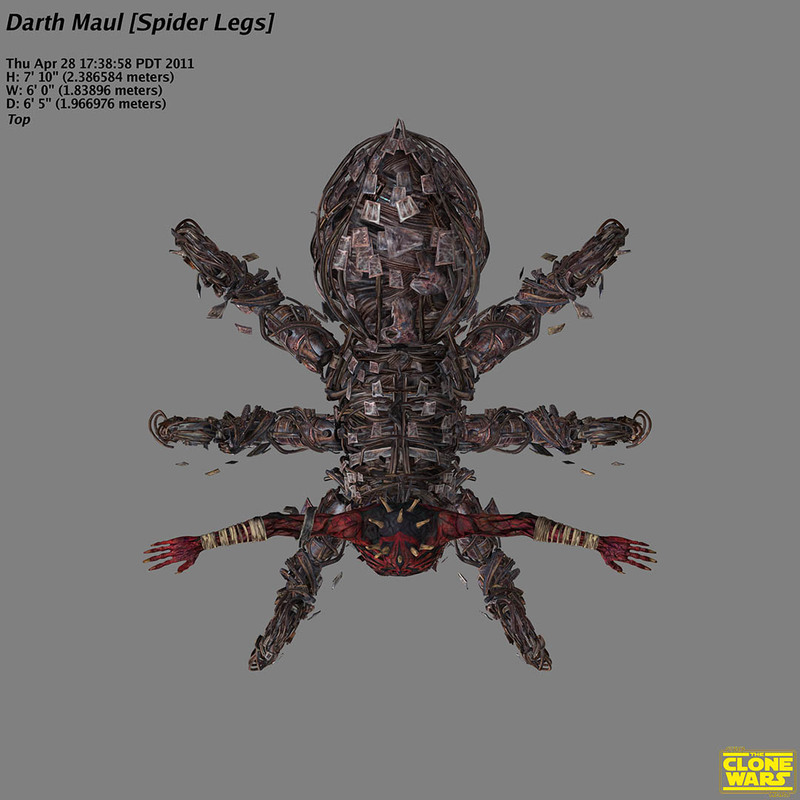 His shattered body delivered to the junk planet of Lotho Minor to waste away, Maul lost his mind, cobbling together a hideous set of spindly spider-like legs to scuttle among the refuse until he was rescued by his brother, Savage Opress. 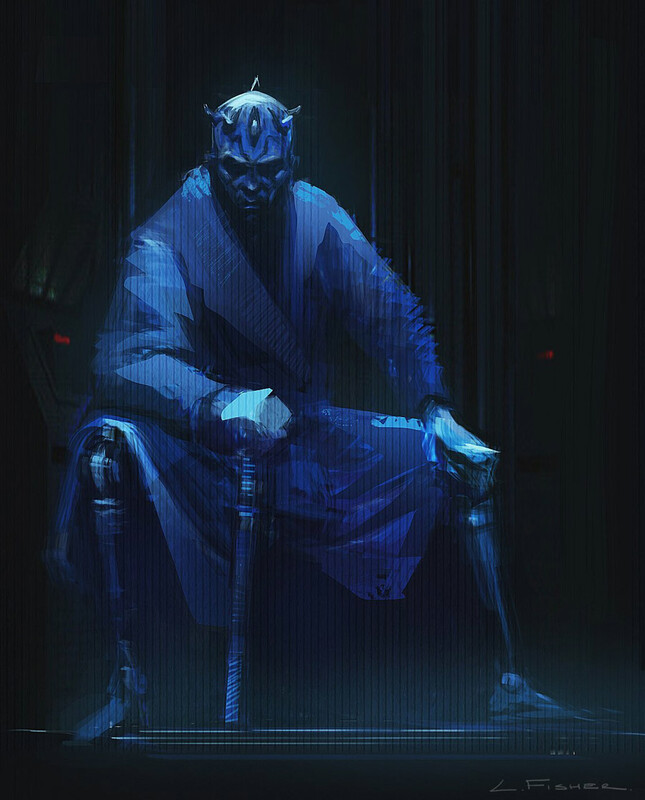 Two claw-like appendages eventually restored Maul to a closer approximation of his original silhouette, and his powers grew, disassociated from the Sith and seeking his own stake in the seedy world of crime bosses and criminals. 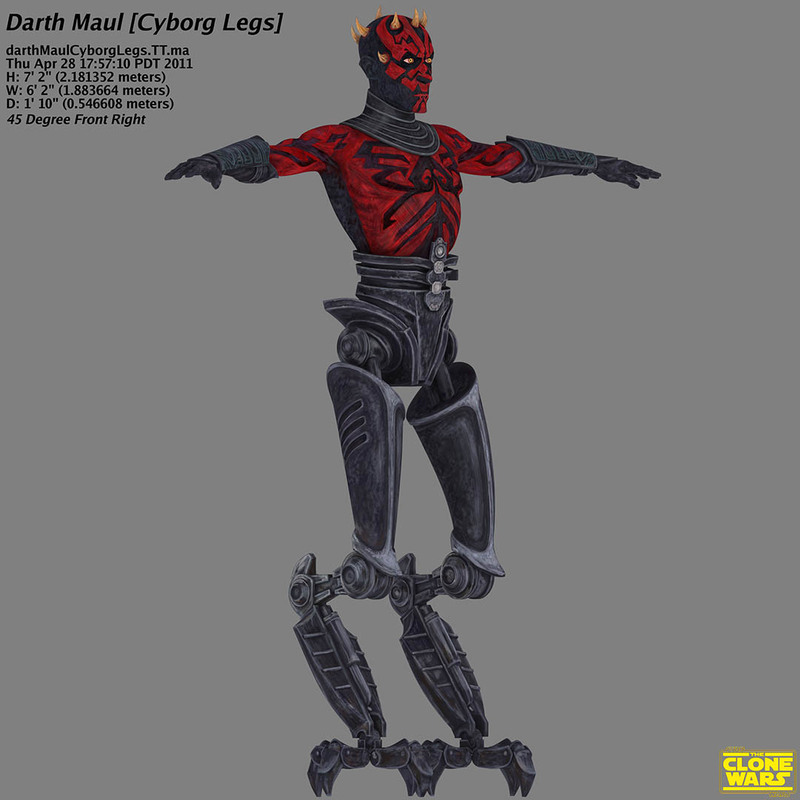 As Maul’s legs were refashioned and upgraded, he never lost sight of his quest for vengeance. Given Maul’s upbringing and training with the Sith, it’s difficult to know how much the loss of half his physical form impacted whatever compassion he may have been capable of, exhibited only in glimpses through his relationship to the brother who came to his rescue when all others had abandoned him. Groomed to be a calculating and cunning warrior, he already exhibited a cold android-like demeanor long before gaining his metal limbs. Then there’s the gruesome droid-general with haunting alien eyes, General Grievous, a monstrous fusion of metal and organic material that makes it impossible to disassociate the two. 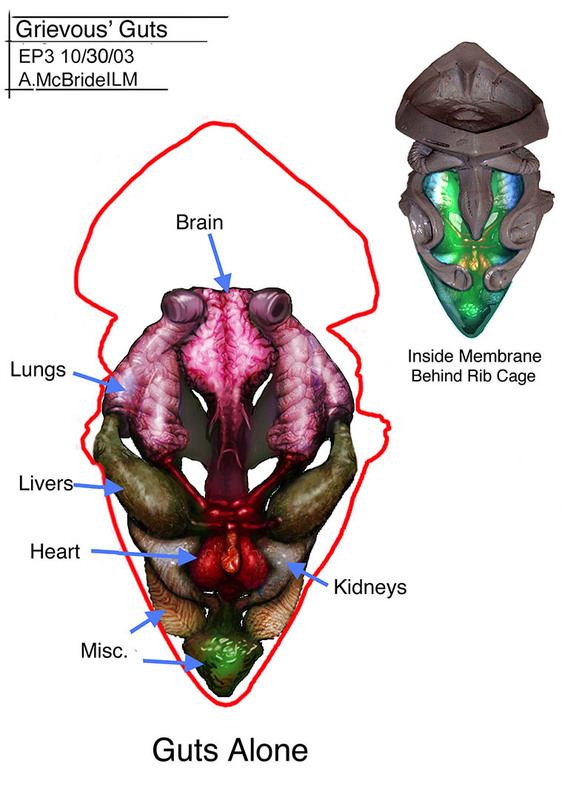 Circuitry was grafted directly to brain tissue, red Kaleesh flesh peeking out from behind his helmet and armor protecting the vital organs that co-mingled with his cybernetic implants. 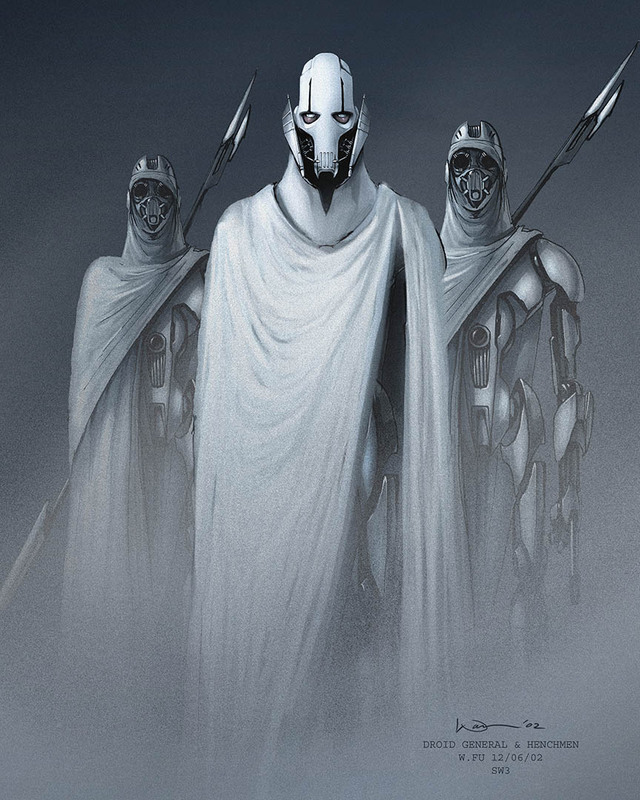 His organic systems essentially scooped out and contained in a battle-ready droid body, Grievous retained but a fraction of his former self, revealed by little more than watery yellow pupils shielded by a fearsome mask and a hacking cough that betrayed his biology. Sequestered in his lair on the third moon of Vassek, a labyrinth of chambers that suggested a connection to an alien warrior and a macabre fixation on collecting trophies from the Jedi he killed in battle, Grievous maintained some control of his modifications, keeping his own droid doctor and spare parts on hand for painful but necessary upgrades and repairs. 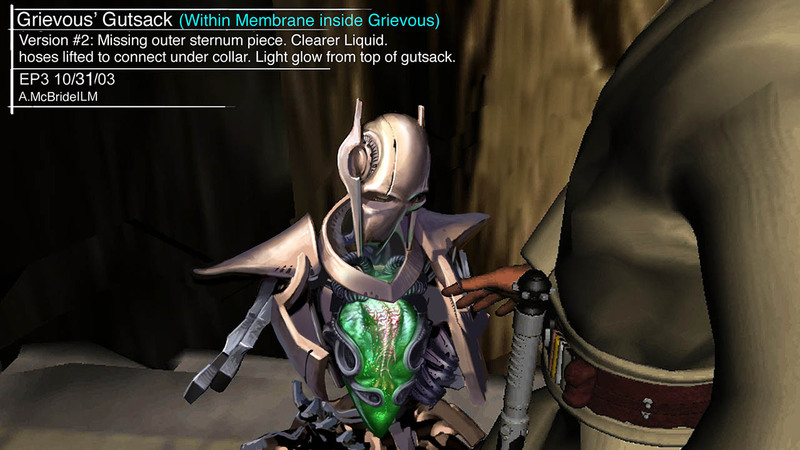 But with a well-placed blaster bolt, igniting whatever parts of his original form still remained – referred to in concept art reference materials as “Grievous’ gutsack” and inspired by real-world biological components and textures as well as the viscous nature of dish soap — Grievous was damaged beyond repair. Among these characters fusing mechanical capabilities with the limitations of their natural qualities, there is perhaps no sadder tale than Lobot. Lando’s loyal aide made a tragic sacrifice, voluntarily giving up his humanity for the greater good and allowing himself to become a blank organic host to a computerized brain. The cyborg construct so prominent on his head was leftover from Imperial employment, a fusion to increase productivity and give him a droid-like ability to run battle calculations and communicate with computer systems. For a time, Lobot retained his identity, but ultimately surrendered his humanity during a failed theft aboard Emperor Palpatine’s personal yacht — tapping into the network to unlock the escape pods so he and Lando would have a chance at survival. 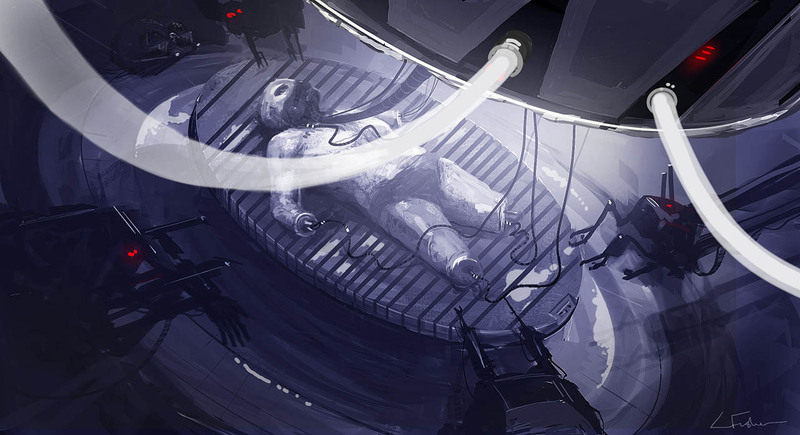 Lobot gave himself over to becoming an emotionless body controlled by the machine and continued to serve by Lando’s side, using his last moments in control of his mind to send a message to his friend that he believed that the scoundrel was capable of more. Featured concept art by Christian Alzmann. Associate Editor Kristin Baver is a writer and all-around sci-fi nerd who always has just one more question in an inexhaustible list of curiosities. Sometimes she blurts out “It’s a trap!” even when it’s not. Hop on Twitter and tell @KristinBaver what you love most about Star Wars!